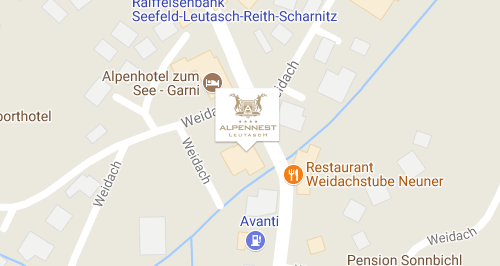 The Alpennest Hotel **** Leutasch is located in the Olympiaregion Seefeld in Tyrol. Feel enchanted the moment you see the amazing peaks of Alps from our mountain view rooftop terrace. Let yourself fall in love with fascinating surroundings of Tyrol, crystal clear mountain lakes and traditional cottages and alpine pastures. Not only our harmoniously equipped rooms, the wellness area and the special details and accessories throughout the house, but also hikes to murmuring streams and colorful alpine meadows or yoga on the rooftop terrace in our sister company Alpenlodge Hotel (from 4 persons, 100 m away) it's time to let your holiday become a real break from everyday life.